Felipe and Andrea are upcoming Wine connoisseurs. They not only own a vine yard and manufacture their own brand but promote multiple other merchandise in and around Spain. As their business expands they are in need of a Digital Face for their organization. This face needs to be constantly updated and integrated with multiple other brands that would help them spread their business. For the same they needed a team of frontend experts to work with them as part of their organization and cater to their needs. IT experts are hard to find in their region, and the ones which are available charge high prices. Hence Felipe and Andrea were advised to either outsource their work or go with a remote team of employees working out of a different location. Felipe and Andrea are used to having a small close-knit team of individuals who act as their core team. The team shares a common vision and is closely connected to all the employees within the organization. 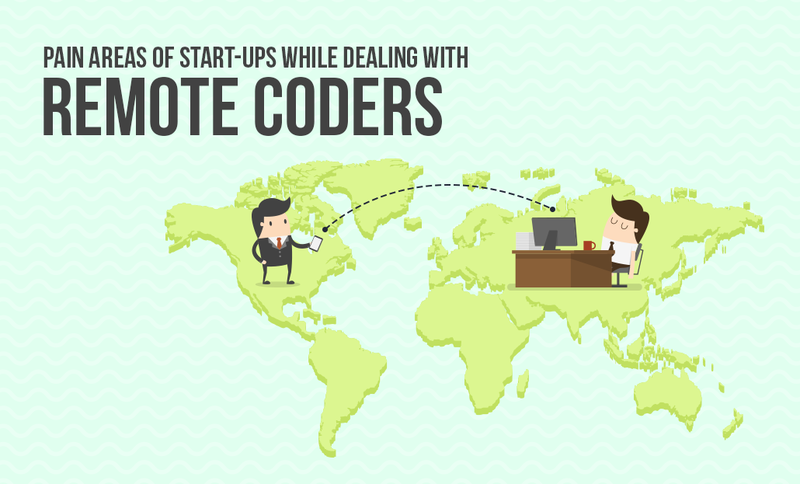 Having a remote team of developers is an alien concept for them and hence are hesitant about it. Remote workers are individuals who work out of geographically isolated locations, distant from their parent workplace. It might be a different country, a different state or just a secluded region. Remote developers can either be freelancers or full-time employees. Remotely distributed teams are a reality that the industry has adapted to with the advent of outsourcing and there is no looking back. SMBs prefer outsourcing their work to remote destinations either due to reduced costs or for better quality products. But due to this isolation do organizations lose control over their product? Does it create an aura of uncertainty and insecurity within the parent organization? Here is an overview on what are the causes of anxiety that plagued Felipe and Andrea before they decided to have employees working out of locations which are away from their administrative and physical reach. This is a major hurdle that Felipe identifies when he imagines working with a remote team. The only way to keep all your team members aligned is by having your communication synchronized. Teams sitting at a single location coordinate mostly by direct interaction, but over multiple remote locations the communication stagnates. There are instances where immediate action is required/demanded but actions are delayed due to lag in communication. Further the constant sharing of information, new findings and breakthroughs and personal interactions are regularly performed on a one-to-one basis in close quarters; but this gets sidestepped when working remotely. Develop a culture of Communication - You should have access to your remote team or individuals over Instant messaging or chat. Platforms where the entire team can share problems and get quick solutions instantly. Slack, Twist and Flowdock are few of the cheap and easily adaptable chat platforms available. Work on language barriers – In case your remote team comes from a different cultural and linguistic background, make sure that they have had common cultural training sessions that provide them with insights on how to communicate with each other. Speech and accent trainings also avert the time spent paraphrasing in meetings and rather help focus on the problem at hand. Andrea hates tardiness. He is known for his efficiency at work. He keeps on top of deadlines and likes to regularly boost his employees to achieve it. The problem Andrea has is that you cannot estimate the work the remote employees put-in in a workday. You can define deadlines by segregating the project into components and set expectations. But monitoring the engagement of employees for predicated hours in a day can be difficult. The challenges that originate in such scenarios are either the timely completion of activities or judging whether the time allocated is utilized by the resources efficiently. Further the quality of code being written and the course the product is taking needs to be verified over intervals, which is also a hurdle with remote development. Reporting Tools - Have a Project management tool in place that will help you and the employees report their daily progress. Effort Tracking tools help evaluate the time segregation of each individual and provides an overview of the billable hours spent without invading an individual’s privacy. Timely, Scoro, Freckle are some of the commonly used time and effort tracking devices for SMBs. Verification - Verification testing can be stringently implemented to constantly validate the quality and alignment of the modules being developed. Verification refers to applications that are still under development to ensure that it adheres to the specifications presiding the design documentation. Segregation of Work - Have your expectations clear about the delivery deadlines and the consequential effect it will have on the project deliverables. Encouragement - Encourage your team members on every productive achievement; be it logging-in for work on time, completing a piece of work before time or just managing healthy work hours. Recognition and rewards help affirm positive behavior and spread a sense of responsibility. When you have remote teams working in time zones that overlap only a few hours with your working hours, it does become difficult to interact and manage such a team. The team operates on autopilot mode based on the set of instructions you have provided them with. If you end up choosing a team which is located on the opposite end of the globe, the overlap is reduced and either one has to extend over odd-hours just to have a connect. It is necessary for the team to be aligned to the goal they are working towards. Not interacting with a lead or manager over extended periods of time cultivates a sense of desertion amongst the employees. Planned Connects - Scheduling regular/daily meetings in such cases turns into a mandate as having a beacon to look to for orientation keeps the employees focused. SpaceTime.am and EveryTimeZone offer helpful tools to schedule meetings over dispersed time zones. Remote management Team - For larger development projects, it is beneficial to have an Administrative team on the remote location which act as a bridge between the developers and you. These management individuals can parallelly coordinate with you as the time-zone permits, providing you with updates. Since Felipe and Andrea started their organization with a handful of individuals, they are used to having personal interactions with their colleagues. This helps develop an organizational culture which all members gradually blend into. With a lack of face time it is difficult for teams to relate to a common vision. Personal presence is important to establish a trust relationship with the team members. The general perception towards remote workers is that they are laid back when they don’t have someone looking over their shoulders. Having different cultural backgrounds add to the trust issues. Mutual goal - A shared mission cultivates a collaborative spirit within the workforce. The knowledge that they together are working towards a common goal and every contribution counts, adds to the responsibility. Team building activities - Telephonic meetings should be replaced with video conference calls which projects personal presence and gives a face to the voice or name that the team been working with. Planning yearly visits to the remote location helps building team morale and facilitates fraternizing with the team. GoogleHangouts, Skype and GoToMeeting are a few video conferencing options you can use. The challenges that Felipe and Andrea see with Remote teams are quite practical but are not impossible to overcome. Extensive research on the compatibility of the remote teams, planning the work-day of members and having clearly defined objectives will help them make a smooth transition to work with remote teams. Though it requires patience and planning in the initial months, the returns you get from a smoothly functioning Remote team are fairly high. There are various models over which you can work with remote teams, like freelancing, outsourced workforce or outsourcing a complete project. Depending upon your budget and the flexibility needed, you can narrow down on one of the models.